How many times did you wish you could replace a nasty story with a harmless one, or vice versa ? 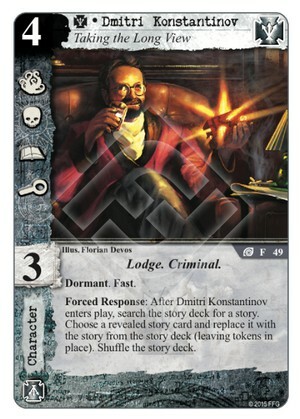 Dmitri has a nice icon spread, Fast and good traits, but Dormant is what makes this card more interesting to change the battleground for the second story while getting a free char. Toolbox tricks with Ardoit-Bonnot could be funny as well... 3/5 and possibly underestimating him. Can he trade out conspiracies? Would they get shuffled into the story deck? or something else? RP, did you ever get the answer to your question above? I see why this guy has gotten 2 stars to date. His triggered ability might not be relevant by the time he enters play. Regardless, it's still quite a powerful effect and shouldn't be diminished, even if it doesn't have an apparent fit in any common deck type. The ability might as well say "When Dmitri enters play, choose and trigger any one of 5 or 6 powerful effects." Dormant does help quite a bit in making sure his ability is relevant in most games too. But forget the ability for a second. Do you know how many characters have all four icon types AND the Fast keyword? Well, you're looking at them. That's right - Dmitri here is the only character in the game who can single-handedly break ties in all five struggle types (T/C/A/I/Skill). If you like Fast, this is Fast at its best. Even without Dormant and his triggered ability, Dmitri's raw stats combined with Fast would have been enough to warrant 4/5 stars. Had he not suffered from being part of the final release of CoC, I think Dmitri would've become a tournament staple for a very long time, and he might've even become Restricted. He can fit into any deck type that includes ST - he'll support whatever struggles you're good at, and he'll make you at least competitive in any struggles where you're a little weak. And his Subtypes offer potential for some really interesting synergies. He is a nice body to have on the ground but 4 is usually too much to pay, and the Dormant mechanic hasn't worked well most times I have seen it tried. It sounds like you'd like him better if he cost 3 and lost the Dormant and triggered ability. I can see the value in that, but then he'd be kind of generic and ST needed another good 4 cost character. They have too many good 3 cost guys already.